LoD has been blazing the charts since its release in fall of 2016. We've been breaking all expectations and it’s all thanks to the fans. A stream of updates continue to add exciting new features to the game. 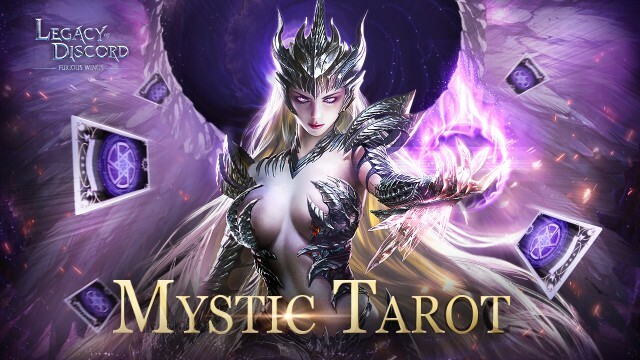 Let’s take a closer look at the brand new Tarot system in LoD’s 2.0.0 updates! A Personal Tarot Altar will be unlocked when a player reaches level 65 while the Server Altar can be accessed at any time. There are three ways to give EXP to the Altars: Free Donation, Diamond Donation, and with the new Tarot cards. Donating Tarot cards adds higher amounts of EXP as well as provide extra rewards. Tarot cards can be obtained by completing Daily Quests. Level up your Personal Altar level to get earnings bonus for Guild Worship, Tower of Eternity, Spirit Growth, Gold Dungeon, Max Stamina, Alchemy Stone, Light Realm, and Expedition. The higher the Personal Altar level, the greater the earnings bonus. When the Server Altar EXP is full, the Angel of Tarots will send out rewards to the entire server and one lucky player will be randomly chosen to receive double rewards! Additionally, Glyphs have gained additional functions in this update. Now Glyphs not only provide attribute bonuses for Wrathwings, they will also add special effects and visual changes to them as well! Legacy of Discord’s list of features has been growing rapidly thanks to a stream of updates from the developers. With new content being released almost every week, players can expect something new every time they log in. Try Legacy of Discord now and see what you’ve been missing!